A whole domain of technology goes towards making your sleeping experience smoother. Comfort does not begin and end with your mattress alone. 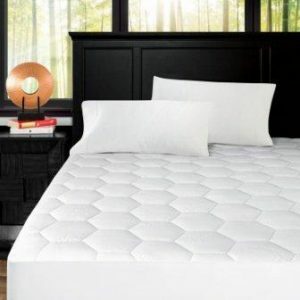 Mattress pads, toppers and protectors have been setting the pace of comfort bedding. Mattress pads can convert any mattress, old or new, into a bed fit for a King’s sleep. These are available with many features too, some including heating apparatus as in heated mattress pads which we covered in another post. 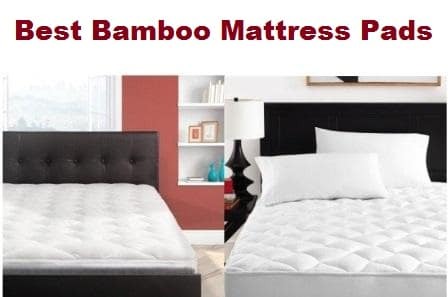 We have been convinced about the relevant properties of the bamboo textile material for some time so, here we have covered the 10 best bamboo mattress pads that can transform your sleeping experience. We have selected them across the pricing ranges and feature sets. The what, how and which of bamboo mattress pads? What’s special about bamboo mattress pads? Which are the best bamboo mattress pads? For laying on a sofa when somebody want to sleep it. Reason for buying: Mattress pads are available with diverse features. 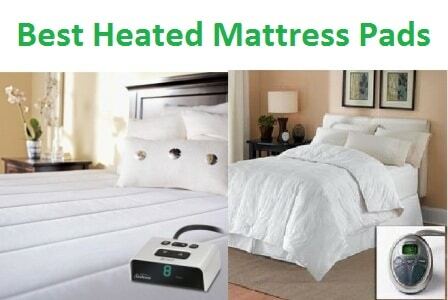 There are heated mattress pads that come with a temperature control for the winter months. There are memory foam mattress pads where the mattress aligns to your body shape when warmed by the body temperature. These also discourage motion and are desirable when you want to reduce tossing and turning. A latex or visco-elastic mattress pads can provide better support to your backbone while you sleep. There are down and alternative fiber mattress pads that provide softness over a firm mattress. Thread Count: The way the mattress pad feels to your body depends on the thread count of its cover. A high thread count ensures that the fill inside doesn’t leak out. High thread count also contributes to a nice, fine feel. 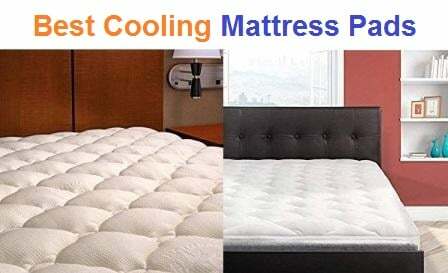 Mattress Pad vs Mattress Topper: Mattress pads are usually thinner than the mattress toppers. Mattress pads can have various purposes: comfort, therapeutic reasons, waterproofing etc.. The mattress toppers are primarily meant to add comfort. Thickness: Figure out how thick you want the mattress pad to be. The thickness can range from 7 inches to 22 inches based on the fill. Mattress Pad Fitness:Mattress pads are also differentiated by the way they are attached to the mattress. Anchored mattress pads have elastic bands on the corner that attach them tightly to the bed. Fitted mattress pads are the ones we selected here. They have elastic sides that hide the entire depth of mattress its tops. Wrap mattress pads have long elastic sides that cover the entire height of the bed. Bamboo plants can grow at a rate much faster than usual fiber plants. In fact, once harvested, it can return to its previous glory within one year. It is a strong plant which doesn’t need chemical help from fertilizers to grow to the full potential. It also survives with moderate amounts of water. Bamboo fiber is more eco-friendly than cotton and timber in terms of its rate of carbon dioxide assimilation and oxygen production. Bamboo fiber also degrades naturally in the soil. Bamboo covers on mattress pads are soft and feel better than high thread count cotton on the skin. The feel is just rich and expensive although these are moderately priced. Bamboo covers are exceptionally resilient. It can take the daily tear and wear from you tossing in your sleep and still maintain its softness. The nature of bamboo mattress pads is such that they allow open ventilation. You won’t feel unnecessarily hot or smothered by the bamboo mattress touching your skin. Bamboo mattress pads have the property of adapting to the climate. In summer, they tend to be cool and in the winters they are warm. Bamboo mattress pads are more resistant to bacteria and allergens compared to cotton and other fibers. Support: The entire experience of a bamboo mattress pad can go for a toss if it doesn’t provide the right amount of support. The best ones align your spine straight on the mattress resulting in a restful sleep.You wake with zero fatigue and no chances of back and neck ache. Comfort: Once we sort out the inconspicuous aspect of support, the comfort of the best bamboo mattress pads is the important priority. We checked the fill amount provide enough loft and cushioned stiffness of the mattress below. Bamboo cover ensures that these pads feel comfortable to the skin. 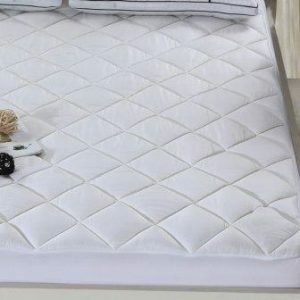 Maintenance: We checked out the best options to clean and maintain the loft of the best bamboo mattress pads. Those that can be washed and dried in the machine got maximum brownie points. Dry cleaning is a little more bothersome. Budget: The best bamboo mattress pads here are spread across a wide range of prices. Whatever your budget be, we want you to get the best for your money. 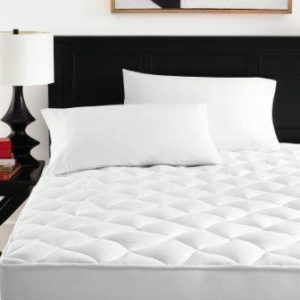 The ExceptionalSheets Bamboo mattress pad is a completely USA-made product that is often used in the premium 4- and 5-star hotels to top their mattress. This extremely breathable pad has been redefining comfort and support since its inception. The reliable quality and the promise of innovative filling got our attention initially. The veteran involvement in the manufacturing process and fitment ultimately convinced us to give it the top spot on the best bamboo mattress pads list. All these are standard sizes that fit the correct beds precisely. The elastic edges give you some leeway in fitting them around slightly larger or smaller bed. All the sizes run 18”deep, so they fit any standard mattress. This bamboo mattress pad is stuffed with Revoloft Cluster fiber made of 30% cotton and 70% polyester. It feels and falls like the down. But it’s not allergenic and is much cheaper. This fiber also traps large quantities of air in between to stay fluffy and ventilated. Your back never gets sultry as you sleep on it through the night. The fiber fill has proved to provide therapeutic support of many users with back issues and pregnant women. The elastic skirt is made of 76% polyester, 16% nylon and 8% spandex. We would be careful while stretching it across a sharp edge. It can get ripped if you are not careful. This ExceptionalSheet bamboo mattress pad carries a 160-thread count bamboo cover. It brings hypoallergenic features to the table. It can be washed in a front loading high capacity machine in cold water on the gentle cycle. It has to be tumble dried further at low temperature. Any use of fabric softeners will shatter the integrity of the material. We suggest spot cleaning this pad instead of washing it. They are confident about the quality of their product, hence their 30-day return policy. The customer service in tune with the claims of the product and they respond immediately to listen to and solve your problems. Folks who have the tough Tempurpedic mattress can use this bamboo mattress pad to sleep comfortably while gaining support from its firmness. It is also Lab-tested and certified in accordance with 16 CFR Part 1632 without bringing flame-retardant chemicals into play.It comes folded in a zipped plastic bag with carry handles for easy transportation. Summers through winters, it offers a sweat-free, non-fatiguing sleep. Zen Bamboo Ultra soft Rayon derived bamboo mattress top is the lifesaver of your mattress. This soft and airy top gives you the plush feeling of a high-end mattress on a budget. It also relays the support of the mattress underneath. The choice of sizes ensures that it can fit any bed of yours. Maintenance is easy if you are a little careful in handling it. All this packed into a highly affordable price ties a bow on its position in the best bamboo mattress pads list. The Zen Bamboo ultra-soft bamboo mattress pad is a plush topping for the bed. The filling is distributed across the pad via double-needle baffle-box construction. This ensures that the filling does not transfer around to one corner of the mattress when washed. The cover is made of 35% bamboo fiber and 65% polyester. It feels soft and silky to the hand.The filling is completely polyester. It is filled for moderately thick softness but not too tightly. These are available in six different sizes: Twin, Twin XL, Full, Queen, King and California King. The sides of this bamboo mattress pad has an elastic skirt. It runs 18 inches deep and covers the sides of the mattress. The elastic skirt is quite resilient, it does not rip easily. The cooling bamboo cover regulates the temperature adeptly during the summers and the winter. Those folks who are prone to night sweats will find this pad supremely comfortable. The bamboo cover allows free movement of air and also keeps the mattress feeling plush and beefy. The Cheer collection Ultra Plush eco-friendly bamboo mattress pad immediately caught our eye with its fuzzy design. It provides superior comfort with its bamboo cover. The standard size options is a great advantage for oddly-sized beds. The hypoallergenic properties that come with bamboo cove render it a widely usable mattress pad. 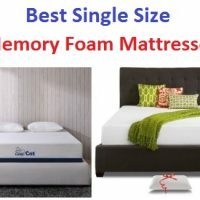 It will make any memory foam mattress usable in the long term. It gets a straight ride to the best bamboo mattress pads list. The cover of this mattress pad made of 60% rayon and 40% bamboo. Air travels and gets trapped inside the pad and leaves it cool. It is also hypoallergenic and keeps your down allergies at bay. It has a silk-like feel without the heat and stickiness of silk. The filling used is the hollow fiber which also gives a free pass for the air to move around. This pad makes a strict barriers against dust mites and bacteria that may collect on the mattress itself. The Twin mattress onwards, you have an 18”elastic skirt that hugs the sides of your mattress. This Cheer Collection mattress pad can be washed in the machine at very low temperatures in a cycle meant for delicate clothes. It can be tumble-dried in the dryer at a low temperature. Always use a large front loading machine for this pad. This is a quite affordable pad but we are yet to hear any complaints about its durability. Unless you disregard the washing and maintenance instruction, you have no issues with the sturdy cover and reliable filling. It has no smell when bought. It can be used right out of the cover. 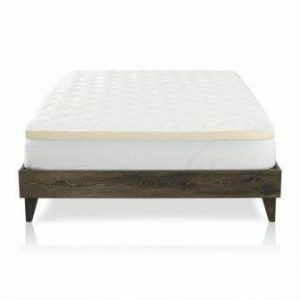 The eLuxurySupply 2-piece bamboo mattress pad with memory foam topper is a unique product. It supports its mattress pad with a mattress topper for those who don’t find thick pads thick enough. The arrangement is also convenience since one can be used without the other. At a very reasonable rate, you get both a mattress pad and a topper. The pad is actually the same piece as the top product on this best bamboo mattress pads list. The eLuxurySupply 2-piece bamboo mattress pad combo consists of their best-selling mattress pad combined with a memory foam mattress topper sheet. The foam is around 2 inches thick with 3-pound density. This provides proper support to the back and keeps its spine aligned straight. The memory foam is not as hard as they usually are in pillows. This is a plush pad that allows your body to relax and shift into a restful siesta. The mattress pad itself has a baffle-box stitch that keeps the filling restricted to independent boxes. This keep the fill from concentrating in one area of the pad even when it’s washed. The fill inside is their top material, the Revoloft. It feels like down in every way except without the crunchiness and the feather pocking at you. This is an excellent down alternative. It is sheathed in 160-thread count bamboo shell. This soft and appealing. It is also hypoallergenic. It resists bacteria and dust-mites. The elastic skirt on the side descends 18 inches and grips the mattress and mattress topper underneath tightly. So no matter how much you kick around in the sleep(not likely with this mattress pad), it will not move. The folks at eLuxurySupply provide a great service with a 30-day return policy which allows you to test the product lightly. The mattress pad top layer can be machine-washed and dried provided you have a large machine and use gentle-low-temp cycles. The memory foam should be spot cleaned. It’s best to avoid spilling anything on it altogether. Zen Bamboo have some of the best bamboo products including pillow and mattress pads. Their Ultra-soft fitted bamboo mattress pad is for the folks on a shoestring budget. It brings affordable comfort to your side when your mattress gives you trouble. The option of mattress pad sizes will cover most types of beds. The return policy helps you evaluate whether this much investment is enough for your purposes. It makes a run for the best bamboo mattress pads list. The Zen Bamboo Ultra-soft mattress pad looks smart in the way it fits over the mattress. It is a snug-fitting topper that forms a cozy layer over your mattress. It has pockets in hexagonal honeycomb baffle stitching pattern. It is not as plush as the Zen Bamboo rayon-derived mattress topper though. This is better suited to protect and form a breathable layer over your original mattress. It is available in the sizes: Twin, Twin XL, Full, King, Queen and California King. This bamboo mattress pad has a cover blended of 40% rayon derived from bamboo and 60% brushed microfiber. It has the cool, calming effect that we expect out of bamboo fibers. The air ventilation is much better than that of cotton mattress pads but a higher price range would get your better breathability like with the ExceptionalSheets bamboo mattress pad. It has an 18-inch elastic skirt that wraps around the mattress and keeps the pad in place when you move on the bed. This Zen bamboo mattress pad does not need to be dry cleaned. It can be put in the machine at the delicate cycle at low temperature. It’s best to use the larger washing machines otherwise this will rub against the machine and tear. This happens even with the best mattress pads. The elastic sides do well in the machine. Users haven’t had an instance where it tore easily. You can tumble dry it in the dryer at a low temperature as well. As always, Zen Bamboo stands behind their product with a 30-day return policy which allows you to try it and return if you are not satisfied with the product. Its hypoallergenic properties have made it the apt choice for many sleepers who cannot use down-filled mattresses. It is also anti-microbial. The Royal Hotel Silky Soft bamboo mattress pad is a middle-of-the-road option for those who have a tight budget but want reliable quality. Built in standard sizes of mattresses used across homes, this mattress pad is blessing for the stiff mattresses. Being machine washable only increases its market value as opposed to. The fitted mattress pad stays put on the bed even for the most active sleepers. This was a great pick for the best bamboo mattress pads list. The pattern of stitching on this bamboo mattress pad can be described as diamond-shaped. This holds the filling place while you move on the bed. It also prevents bunching while the mattress is being watched. It has elastic skirt on the sides which fits it snugly on any mattress. It extends 18” deep which is enough to cover the tallest mattresses. The bamboo fabric of the shell is ultra-breathable. It brings you respite from the stuffiness of hot nights. It also retains heated air when the winter kicks in. This Royal Hotel bamboo mattress pad can be stashed in the machine for a cold wash. We suggest large laundry mats for it. It can also be tumble-dried in the dryer. 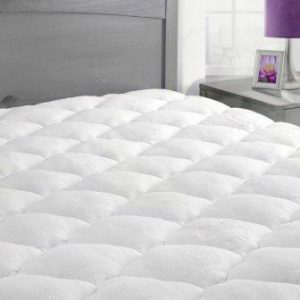 Unlike slightly cheaper mattress pads this does not have that plasticky texture and crunching when you shift on it. It’s the fixer topping that makes any mattress worth using on a budget. It has proved to be much more reliable for a small budget jump from the cheaper fare. 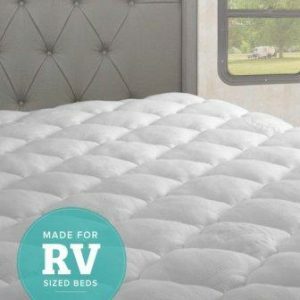 The eLuxurySupply RV mattress pad is a plush topping for your mattress. Made by a veteran-owned firm, this pad scores well in quality and user satisfaction. They use the same revolutionary filling that Exceptional Sheets prides itself for. The price is reasonable for the quality and features. The durability of the cover is accompanied by exceptional looks and feel that only bamboo fiber can provide. This is a no-brainer for the best bamboo mattress pads list. The eLuxurySupply RV bamboo mattress pad has an extra-plush structure that cements your conviction in its comfort. The double-needle baffle box construction traps the filling properly and reduces the chances of bunching up. It packs 25 ounces of Revoloft fill per yard. This types of filling has the advantage of promoting exceptional airflow. So you don’t wake up sweating from sleep. It also paves the way for a restful sleep so you wake up refreshed after the 7-8 hour shut-eye. This eLuxurySupply bamboo mattress pad can be washed in the machine at a gentle cycle. It can be put in the dryer for tumble-dry with low temperature setting. The use of fabric conditioner is a sure-shot way of damaging this mattress pad. This pad is completely made in the USA. They offer a money-back guarantee feature in case the pad doesn’t meet your requirements. You can return it within a 30-day return period of buying it. The manufacturer has suggested this as a great option for beds in recreational vehicles, hence the title. Spa Luxury presents a budget oriented bamboo mattress pad that’s fits in with all our expectations. Available in 5 different sizes, this pad fits the standard sizes of the mattresses. The Bamboo cover facilitates a clean flow of air throughout the mattress. This way, your back remains cool even as you lay on it for hours. This is assembled in the United States. The posh feel and the heat-assimilating abilities lands you in the best bamboo mattress pads. This bamboo mattress pad runs 20”deep. It can fit any mattress from 7 inches to 20 inches deep. The extended length might even cover an air mattress completely on the sides. The extra plush filling amount makes a comfortable topper on the Tempurpedic mattress. The skirt fits nicely over the sides of the mattress and keeps it from bunching up when you sleep. It doesn’t have the plasticky feel that most affordable mattress pad elastic skirts have. The fiber feels soft and silky which gives you a rich feel that’s hard for a mattress to counter. 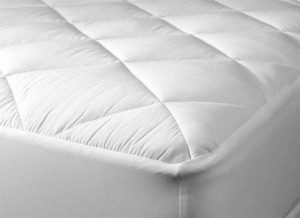 The mattress topper is made of Certipur-certified memory foam. This Spa Luxury bamboo mattress padcan be washed in a large laundry machine. Using anything smaller will cars wear and tear on the cover. The elastic skirt itself is quite strong and doesn’t need any strengthening. The dryer cycle should be at low temperature. We suggest spot cleaning instead of washing it often. Dry cleaning is not required though. The users have lauded how it improved their sleep experience through the breathable bamboo cover. It performs well for the price and is a nice alternative to the expensive pads on this list. 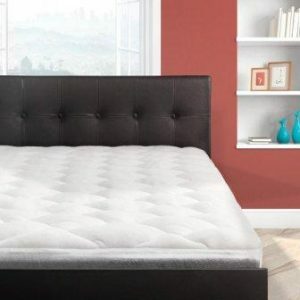 This Cardinal & Crest bamboo overfilled pillow top mattress is another affordable and quality product in this niche. This bamboo product brings the familiar coolness into the picture. The choice of sizes offered cover all the usual bed sizes. It is moderately plush and allows you to feel comfortable over stiff mattresses. The laboratory-tested safety and durability ultimately led it to the best bamboo mattress list. The shell of this bamboo mattress pad is made of a rayon and bamboo blend. It helps keep the body cool. Cool sleepers will like the feel and temperature of this mattress. It’s also hypoallergenic and resistant to bacteria. It forms an extra layer of protection against the dust mites and bedbugs that might be present on the bed. It has an elastic skirting on the sides which tightens it over the mattress. It runs 18 inches deep and can cover the tallest mattress in its grip. The manufacturer claims that this has been lab-tested and proclaimed safe according to federal flammability without the use of flame retardant chemicals. This bamboo mattress pad is made entirely in USA. You can rely on the durability and quality of material used in these. The puffy feel fits the requirements of most sleepers who prefer being covered in plushness. It is the fluffier alternative to the Royal Hotel Mattress pad we covered previously. Egyptian Bedding plush bamboo mattress pad draws the curtain on our best bamboo mattress pads list. It gives you the top bamboo performance at an affordable rate. The choice of sizes makes it fit the beds of all standard sizes. The promise of durability comes from a well-known brand. The low maintenance of the mattress pad only adds to its benefits. This bamboo mattress pad is skirted by 18” elastic side which hug the mattress this is laid over. This is enough to fit even the tallest mattresses. The pad is hypoallergenic and resistant to bacteria. It can be machine-washed in cold water in a high capacity machine. It can be tumbled dried in the dryer. As usual fabric conditioner would ruin the bedding.